This three-dimensional view of asteroid Bennu was created by the OSIRIS-REx Laser Altimeter (OLA), contributed by the Canadian Space Agency, on NASA’s OSIRIS-REx spacecraft. 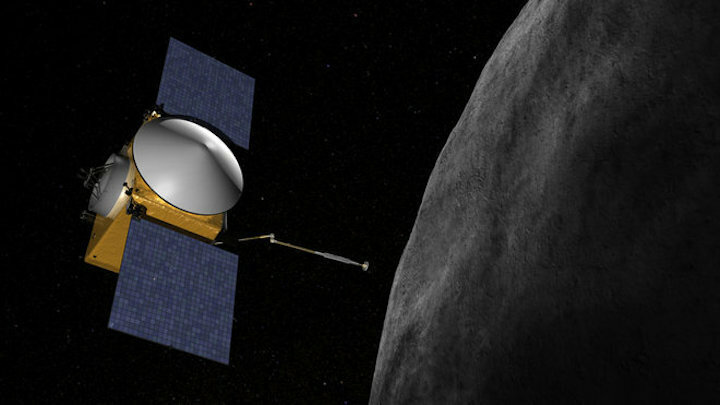 From Feb. 12 through 17, OLA made more than 11 million measurements of the distance between OSIRIS-REx and Bennu’s surface as the spacecraft flew less than 1.2 miles (2 km) above the surface – the closest orbit ever achieved by spacecraft. OLA obtained these measurements by firing laser pulses at Bennu and measuring the amount of time it takes for the light to bounce off the asteroid’s surface and return to the instrument. That time measurement is then translated into altitude data. Using this data, the OLA team created the 3-D model of Bennu’s surface. The colors represent the distance from the center of Bennu: dark blue areas lie approximately 197 feet (60 meters) lower than peaks indicated in red. Some parts of the asteroid have not yet been measured, which creates gaps in the image. OLA will take nearly a billion more measurements throughout 2019 to complete the first-ever high-resolution 3D lidar map of a near-Earth asteroid.